This chapter describes a smartphone-based prompted recall travel survey that aims to collect more accurate data for transportation modeling. 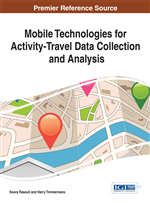 It details the design and implementation of the survey, including the smartphone app for the Android platform, the mobile phone-based prompted recall method, and the management, manipulation, and analysis of GPS data for trip characteristics imputation. The survey commenced in October 2013 and was a person-based pilot study designed to be collected over a week. Although it did not provide a statistically representative sample, the overall experience helps establish the various parameters and procedures for the development of surveys with similar initiatives. The chapter concludes with findings and lessons learned from this smartphone-based travel survey and suggestions for how future smartphone-based surveys might be prepared and conducted. A comprehensive description of GPS and its capability to provide detailed time and location information for travel surveys and research is given in the Handbook of Transport Geography and Spatial Systems (Wolf, 2004). The first GPS-based survey is attributed to the Lexington area travel data collection test in 1996, which was a successful “proof of concept” study (Division, 1997). Since then, GPS-based recording of travel has been promoted rapidly worldwide (Doherty et al., 2001; Stopher & Collins, 2005; Bar-Gera, 2007; Moiseeva et al., 2010; Zhong-wei et al., 2010; Spissu et al., 2011). Although GPS devices can provide accurate data on travel time and location, detailed information about stops, travel mode, and purpose still have to be obtained by imputation algorithms.